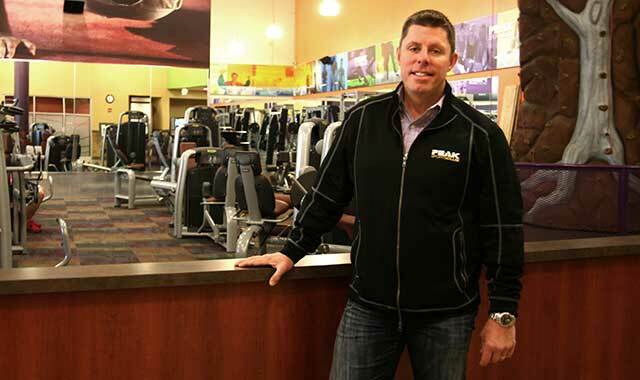 Mark Banz, owner of Peak Fitness and Peak Fitness Sports Club, learned about self-employment from his father. In the film Field of Dreams, a mysterious voice tells Kevin Costner’s character Ray Kinsella: “If you build it, he will come.” Kinsella then receives a vision of a baseball diamond in the middle of his cornfield, and magic ensues. Mark Banz didn’t hear voices, but a cornfield and a bold vision certainly figured into his success story. In 2004, Banz already owned Peak Fitness at 4304 E. State St., Rockford, but he was dreaming bigger. One day, he drove along North Perryville Road in Loves Park, noticed the field, and experienced his own Ray Kinsella moment. What Banz envisioned is now the sprawling Peak Sports Club, 4401 Peak Dr., Loves Park. His sketches were more than just doodles on the back of a cocktail napkin. Banz once dreamed of becoming an architect; what he drew would look quite familiar today. “All of my initial, conceptual drawings from quite a while ago are probably 80 percent accurate of what we ended up building,” he says. Today, thousands of people use the two Peak facilities daily. “I haven’t done this alone. My wife Jill has been with me every step of the way, and we have a truly great management team and staff.” Mark and Jill have been married for 21 years and have trademarked both Peak Fitness and Peak Sports Club. They plan to expand their concept to other small cities around the U.S.
That’s quite a transformation from an overweight kid who was more into music than sports or fitness. Banz grew up in Rockford, graduating from Guilford High School in 1984. He still didn’t know he’d make a career of it. He attended Rock Valley College and worked for his father, Werner Banz, who owned a series of coin-operated laundries. Werner Banz owned a storefront on North Main Street, next to the Olympic Tavern. In 1989, the space became available, and Mark took a chunk of his college savings, borrowed some money and leased the building from his dad. On Feb. 14, 1989, he opened his first business: Express Discount Video. For the next nine years, Banz succeeded in the video rental business, expanding to three locations. He left Rock Valley even though he was almost finished. “I was going to go back,” he says, “but then I kept expanding the video stores and kind of became successful with it, so I never made it back. I probably learned the most that first year when I opened my own business from scratch,” Banz says. At the same time, his passion for fitness was continuing to grow and he recognized a national trend. So, in 1998, he and his dad built the 40,000 square-foot building at 4304 E. State St. Another Express Discount Video store would occupy 10,000 square feet, and the first Peak Fitness would take 30,000. As Peak’s popularity took off, the video rental industry began to wane nationally. Recognizing this trend, Banz closed his three video stores and poured all of his energy into Peak. In 2001, he had the wall separating the two businesses knocked down, and turned the entire building into an expanded Peak. The switch from a couch-potato-oriented business to the antithesis wasn’t as big a business transition as one might think. As Peak succeeded, Banz envisioned a larger, family-oriented facility – ideally located along a bike path, in a growing residential area. That’s about the time the Perryville cornfield came into view. He ended up buying just under 20 acres from developer Kurt Carlson. Ground would be broken for Peak Sports Club in 2006. But first there were those sketches. As Banz worked with the Larson Darby architectural firm, he got to play out his own architectural ambitions. For instance, Banz knew he wanted an airy, open feel for the 80,000-square-foot facility. He also knew a 90-foot span would be hugely expensive, so he studied the most cost-effective way spans could be incorporated along with a few supporting columns. Along with large cardio room, weight rooms and workout classrooms, Peak boasts amenities like a climbing wall, a basketball gym, women-only workout room and a childcare center for kids up to age 10. Even a hair and nail salon and a physical rehab center rent space here. Outdoors, a two-story waterslide beckons people driving by on Perryville. The deck has more than 500 lounge chairs, and Banz says there’s room for 1,000 people. Both Peak locations are open 24 hours, seven days a week. Banz says even in the wee hours of the morning, people work out. Busiest times are before and after work: from 5 to 7 a.m. and from 5 to 8 p.m. Peak Sports Club sits on 9 acres. Banz has resold some of the surrounding land, which now is earmarked for strip malls with restaurants and shops. He’s not finished with Peak, either. Outdoor tennis courts also might appear in the next few years. It’s all part of an experiment to see what works … and what can work in other markets. This entry was posted on Friday, December 6th, 2013 at 11:56 am	and is filed under Northwest Business Magazine. You can follow any responses to this entry through the RSS 2.0 feed. Both comments and pings are currently closed.